Crow/Clay & Associates designed the remodel of the Casino’s Warehouse 101 bar. 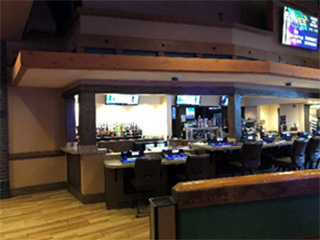 The bar area was shifted to a location which opened on to the gaming floor allowing bar service to both Warehouse 101 and the gaming floor. The relocation of the bar required relocation of an existing restroom. Warehouse 101 was provided with an area of raised seating and the Timbers coffee bar area was expanded.